If you were to take a close look at your current supply chain, you would see the spiderweb of production and information flows that include purchasing, research and development, information systems, finance, logistics, warehousing, shipping and more. Now, pay closer attention to the goods and materials that flow up and down that supply chain and you will find countless areas that experience unnecessary waste and expense. Some companies report using as many as 300 – 1,000 suppliers just to accommodate their maintenance, repair and operating supply (MRO) requirements. Those numbers do not include the use of big box suppliers for one-off purchases — last minute items that experience higher per-piece markups and delivery costs. All told, there are an incredible number of touchpoints that must be constantly monitored for cost and efficiency. That is why there is no better time than now to audit your supply chain management process. Do you recognize any of these production challenges? Click Here to Inquire About a Consultation! Keep reading to learn more about how supply chain management can dramatically lower your total cost of ownership (TCO). Whether you manufacture tools, automotive parts, electronics, medical equipment or any other commodity, you know that managing all of your partnerships is complicated, inefficient and costly. That is why managing your MRO is one of the best places to begin streamlining your supply-side activities. However, this is where many organizations fall short. Managing your supply chain requires a holistic view of your current process, as well as a thorough examination of each link involved in that chain. This exhaustive examination must happen before you can begin uncovering ways to eliminate unnecessary expense, handling or movements. The very idea of taking such an in-depth look at these interactions is often the reason why MRO management falls to the wayside. 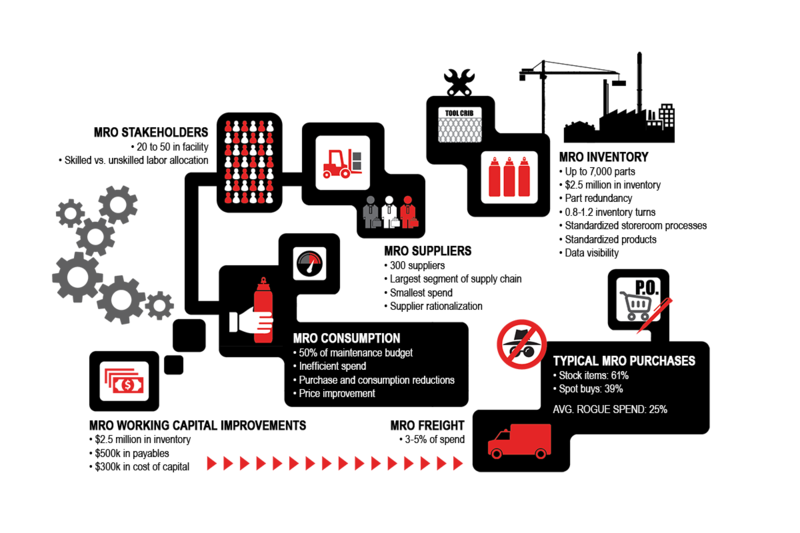 Who is responsible for MRO buying, control and management of supply operations? Who maintains the proper levels of inventory needed for production? Are MRO items often missing or unaccounted for? Can you spot any gaps or areas that could be improved? When was the last time your supply chain processes were audited? The solution is Integrated Supply. 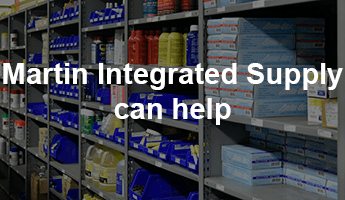 What is an integrated supply chain? The process of outsourcing (or consolidating) MROP/indirect material purchases and inventory management processes in order to drive cost savings, improve efficiencies, and improve end-user focus on finished goods. Martin Integrated Supply offers an array of services that are customizable to meet your company’s needs. After an in-depth current state assessment of your facility and operations, we transform and streamline your processes through a series of scalable solutions that include storeroom management, non-stock sourcing and web-based ordering systems. These solutions focus on every component of the supply chain from acquisition, storage, shipment, logistics, inventory, implementation and support to meet your unique objectives. Our goals for you include increased cost savings, decreased labor costs, improved storeroom processes and access to real-time inventory data. We help you operate better while providing a total lower cost. We realize that different businesses have different needs. That is why we have created scalable solutions that cater to your indirect material spend requirements. Solutions that help you reduce inefficiency, eliminate part redundancy, manage your inventory and avoid rogue spend. We help you plan better, so you save time and money from acquisition and transportation to warehousing and production. Whether your organization is large or small, we can help you save money, reduce paperwork and stabilize pricing — all while improving your bottom line. Unlike other companies that focus primarily on procurement alone, we work with you to manage, plan, execute and control your MRO spend to help your supply chain run more efficiently. Are You Interested In These MRO Process Improvement Opportunities? Data Analysis: We review data constantly. Everything from Min/Max levels, disbursement history or lead time is thoroughly examined. This allows us to take advantage of a quantity break, to change the physical layout of the crib or to notice a trend that needs discussing with a supplier. We believe that taking early initiative with data helps to prevents crisis down the road. 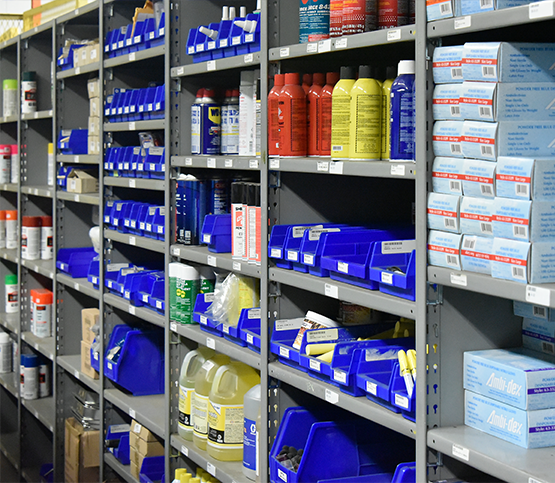 Shared Spares: For our enterprise customers, we look for same items across multiple locations and determine where inventory could be consolidated — while still maintaining the same levels of operational support. Cycle Counting: A robust cycle count program is critical to good inventory management. We utilize barcode scanners to achieve accurate and timely counts. Our counting policies include both a wall-to-wall count, as well as A/B/C tiered counting. This combination allows us to optimize the counting process throughout the year— ensuring that the critical and high usage items get the attention that they need. A well-run plant cannot remain that way without a well-run maintenance department. That is near impossible to achieve when you do not have the right parts in stock to fix your machines. 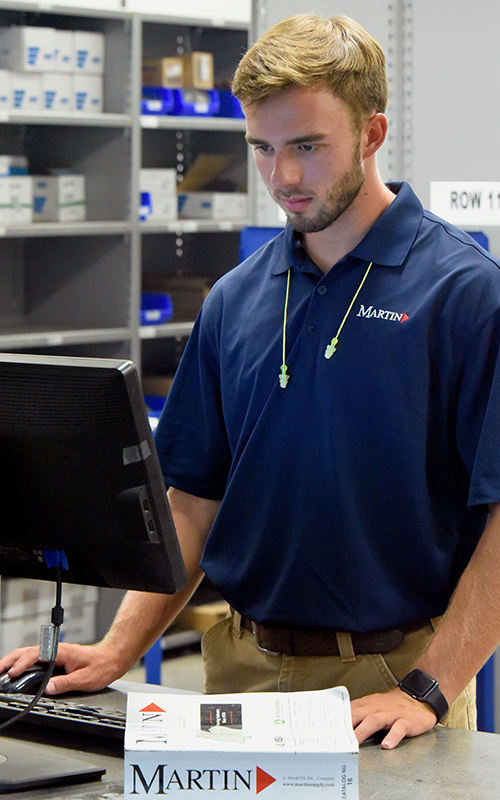 Martin puts our analytics to work for you to ensure that your inventory has what you need to maximize uptime. MRO material spend can be as high as 40-45% of an annual procurement expenditure. So, we integrate our storeroom management with your maintenance team to customize a program that meets your specific needs. 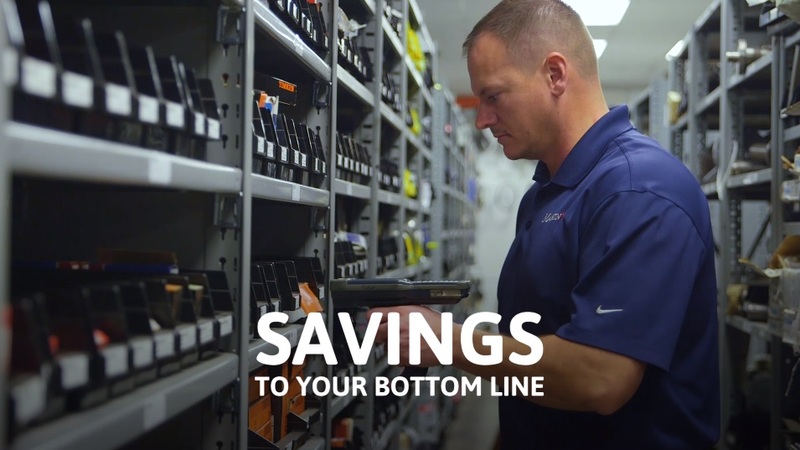 We will help you plan better for both routine and unforeseen maintenance issues to help you track inventory, save money and reduce downtime. High Fill Rate: We perform Bin Integrity Audits to ensure that products are where they are supposed to be. We will relentlessly cycle count to guarantee that the assets we control are in place. Application Expertise: Consolidating your interactions with countless suppliers does not mean you lose out on their knowledge and support. We have access to experts across multiple applications and bring them on-site to help you improve your performance. We will work alongside you to continuously improve your productivity performance. 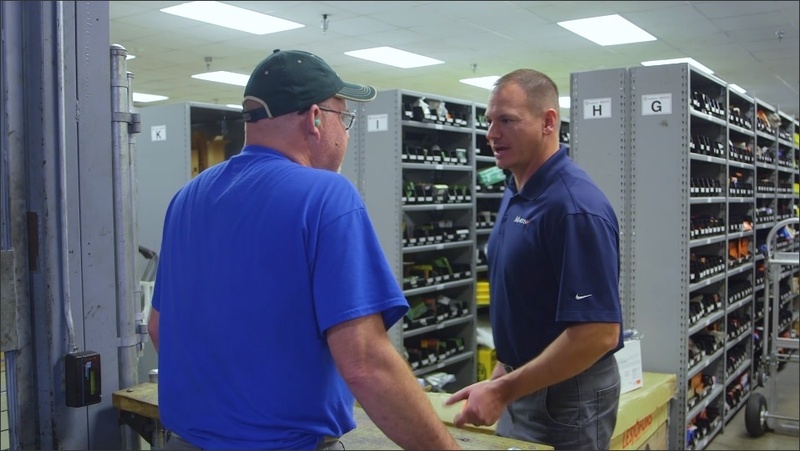 Partnership: Unlike many other MRO integrators, we stay connected to your team on the plant floor. We enable our on-site staff to respond to situations that occur outside of routine maintenance to cover any problems until engineering can determine the root cause. All you need to do is reach out to us and we can schedule an on-site current state assessment. We will meet with you to identify your unique challenges to customize a program that is tailored to meet your needs. We can help professionals in all facets of operations, finance and purchasing departments to optimize performance, reduce spend and power your bottom line. 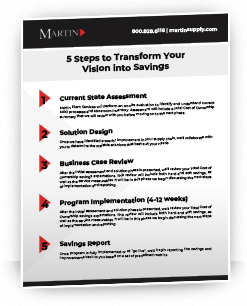 At Martin Integrated Supply, we help companies operate better!